Time for another big Marvel update! 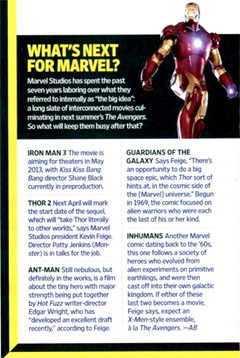 The recent issue of Entertainment Weekly has been providing a lot of good updates on The Avengers, now its given us even more juicy tidbits to consider for the future of Marvel Studios, with an update blurb called "What's Next for Marvel?" - meaning beyond The Avengers, once that hits in May 2012. The answers, from Kevin Feige, include a few we know, like Iron Man 3 and Thor 2 being directed by Patty Jenkins, a brief bit on Edgar Wright's Ant-Man, then there are some interesting quotes and info for two more: a Guardians of the Galaxy project and even Inhumans as well. Read on! This info comes straight from the new EW print issue, but the the original text updates online for these come from io9 (via SlashFilm), but Comic Book Movie has a scan of the blurb, which you can see directly to the right. Here's the key updates they put in the piece, which come mostly straight from Kevin Feige himself. Iron Man 3 - The sequel is aiming to be in theaters in May 2013, with Shane Black directing. Same as its been, as we've recently published updates on both Robert Downey Jr. and Jon Favreau talking with Shane about the sequel. Thor 2 - Starts shooting next April, will "take Thor literally to other worlds," says Kevin Feige. Director Patty Jenkins is indeed in talks to direct, which definitely makes this another one of their projects to keep an eye on. I'm very intrigued to see what she does with this. Ant-Man - The project is still "nebulous", but definitely in the works, with Edgar Wright still attached, who has "developed an excellent draft recently," says Feige. Good, but still not sure when we'll ever see this. Marvel must have a time-line where Ant-Man will work into an Avengers sequel down the line? Guardians of the Galaxy - "There's an opportunity to do a big space epic, which Thor sort of hints at, in the cosmic side of the [Marvel] universe." The Guardians of the Galaxy are a team of alien warriors who were each the last of his or her kind. They originally appeared in their own series in 1969, with a follow-up group in 2008. This could be very interesting to see, lots of potential for an X-Men-like concept, which is exactly what Feige says next. Maybe they're having fun with The Avengers ensemble? Inhumans - "If either of these two last becomes a movie, Feige says, expect an X-Men-style ensemble a la The Avengers." So, the Inhumans are another fictional race of superhumans, created by Stan Lee and Jack Kirby in 1965. EW explains "this one follows a society of heroes who evolved from alien experiments on primitive earthlings, and were then cast off into their own galactic kingdom." Okay, so now we're getting galactic in scope and more hard science fiction, which might be interesting to see Marvel try and pull off. We've actually known for a few months that Marvel has been in development on a Guardians of the Galaxy movie, and while we haven't reported on it here, there were rumors of an Inhumans project, too. I'm just wondering why they didn't mention Dr. Strange, which I really want to hear about, or Runaways or Black Widow or Black Panther or War Machine or even Deadpool, if they're talking about Marvel's future. There's plenty that's supposed to be in the works and I want to hear some updates on all of those projects as well! For now, it sounds like Marvel's future is focused on The Avengers coming up next year, and the line-up directly after, with Iron Man 3, Thor 2, Captain America 2, and a whole bunch of other potential projects on the plate after that. They keep teasing at quite a few possibilities, I still can't stop thinking about where Thanos' Infinity Gauntlet is going to take us, but who knows, we have a long way to go before we get there. I am interested to see Marvel do a more space-oriented adventure, whether it be Dr. Strange or Inhumans or one of these other projects, let's make it happen! Which Marvel movies are you most interested in? Yeah. I want to hear about Dr. Strange. Also I want to see Marvel get their properties back. I think Deadpool may end up Marvel's "Sin City"... which will never get made. The list is wrong, where is Excalibur ?? Deadpool is FOX this is Disney's Marvel. @Posthuman Scarlett Witch, Moon Knight and Vision have not been mentioned as their own movies maybe Moon Knight has. I would imagine we get them in an Avengers or a movie of another SH movie before they get their own spinoff. Why we didn't hear about War Machine and Black Widow because these other 3 are further along in development than those 2. After Avengers #1 comes Ant Man, then he can join Avengers in #2 and introduce Ultron as villain... Then finally we can get The Vision in Avengers #3 Whoot!! all this sounds great...what about when Spiderman joins the Avengers later down the line? Power Man and Iron Fist, done with a nod to 70's movies like Shaft and Enter the Dragon. You know you want it.